Last week somebody called the cops on this 1994 Plymouth Voyager low-budget ice cream van for swerving into oncoming traffic and slamming curbs. Cops rolled up and arrested the allegedly intoxicated driver while he was selling ice cream to kids. Oregon Live reports the Washington County Sheriff’s Office arrested a local 38-year-old running the van for “driving under the influence of intoxicants” in Cornelius, Oregon on July 10th. I feel bad hanging crap on a small businessman just because he can’t afford an elegant storefront. But being loopy enough to buy a DUI charge on a job that involves driving around kids is idiocy of the highest order and warrants public shaming. 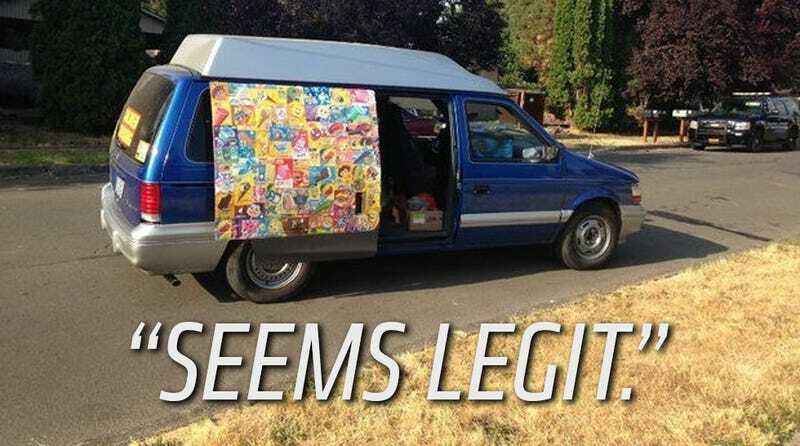 This has been your usual reminder to stay away from sketchy vans. Then again, a drunk ice cream guy might be more apt to dole out some sweet deals. Approach at your own risk? Hat tip to DeeVee! Image via Washington County Sheriff’s Office.